The 2018 Guide to Local Food and Farms is here! Looking for something to do this weekend – or any other? Why not visit a farm, a farmers market, pick your own local produce or eat a delicious meal inspired by local farms at one of our member restaurants?! 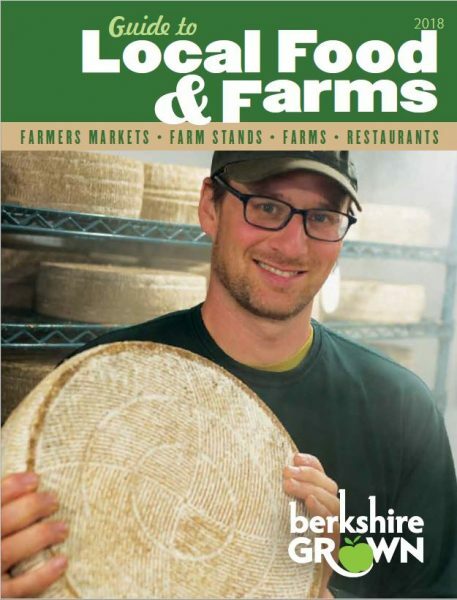 Berkshire Grown’s annual guide to locally grown food is the go-to reference for local food and farms in the Berkshires and surrounding areas. Look out for it throughout the county this summer, at farmers markets near you, and in the mail if you’re a Berkshire Grown member. Special thanks to our members, MA Department of Agricultural Resources, the Dr. Robert C. and Tina Sohn Foundation, Berkshire Theatre Group, Lee Bank, Greylock Federal Credit Union, Guido’s Fresh Marketplace, Jacob’s Pillow, Wild Oats Market, Berkshire Co-Op Market, Berkshire Agriculture Ventures, and Western Massachusetts Food Processing Center for their help in making this guide possible.